Roasting strawberries is a delicious way to bring out even more of their sweet flavor. This simple recipe tops roasted strawberries with a sweet coconut whipped cream for a delightful dessert. If desired, you can make a chocolate version by adding 1 tablespoon of cocoa powder to the whipped cream recipe below! Toss strawberries with coconut oil and 1 tablespoon of maple syrup. Place a piece of parchment paper on a baking sheet and lay the strawberries on top in a single layer. Roast for 20 minutes, or until berries are tender. While berries are roasting, add coconut cream to a large bowl along with the remaining maple syrup. Whisk by hand or use an electric mixer for 2 minutes, or until fluffy. 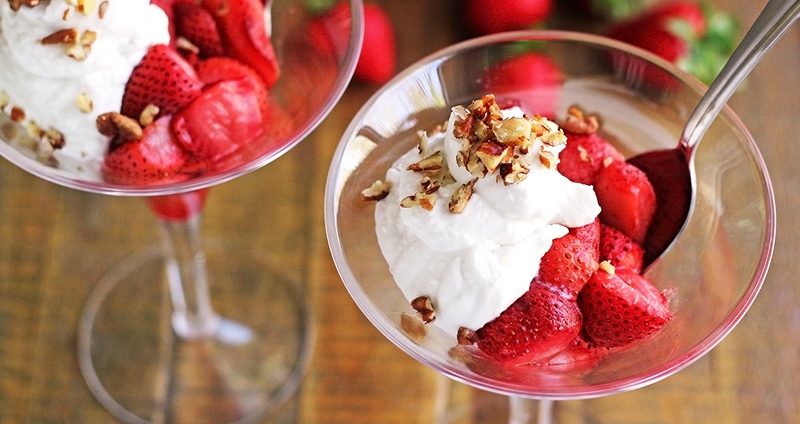 Divide the berries among 4 bowls or glasses, and top with the coconut whipped cream and walnuts. Serve immediately.